Herringbone flooring has been around for thousands of years. Herringbone floors can be made from all types of species, whether it’s new material or antique reclaimed material. 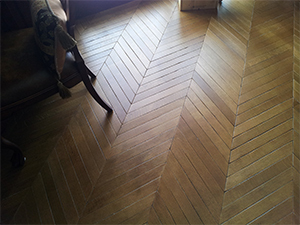 Other than laying a floor in a herringbone pattern, we can also bring full customization to the floor. We can control the specie, texture, sheen, and board width. We have the ability to make a formal herringbone floor look like an ultra rustic herringbone floor. If you’ve seen a floor online, we can likely match it. All these types of floors can also be used in other applications, such as feature walls. Herringbone floors look great on dance floors and other public areas, in kitchens, living rooms, foyers, dining rooms and hallways. At times, they are used throughout an entire space. Or they are used sparingly, in an entrance, or in one room. There are different types of herringbone and we install them all. The most common types of herringbone we install, are English, French, and a variation of French herringbone called Fougere. It’s hard to ignore the presence herringbone makes in a space and it instantly becomes a feature. One of our favourite ways to finish a herringbone floor is to have texture in the floor. Herringbone flooring tends to have a formal look. But it doesn’t have to. With texture added to the floor, it creates a very inquire appearance as the rustic texture has a juxtaposition effect to the formal pattern. Formal meets rustic. With stains, herringbone flooring can look traditional like it came out of a castle built a thousand years ago. Or in contrast, it can look very modern, or trendy. We are also able to recreate any herringbone flooring style you may find online through social media or work with your ideas.